Skulls, bones, and the color black are in. I know what you’re thinking – what is this, Halloween? Although Halloween is still 4 (long) months away, the grunge look is totally in. 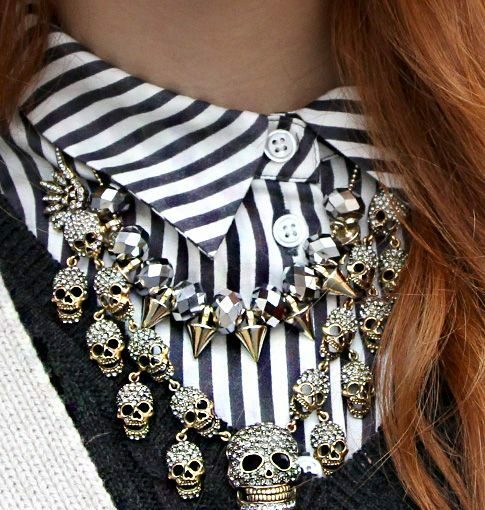 An edgy skull necklace is all the rage right now, and you don’t want to miss out on this trend. Popularized by the iconic Alexander McQueen, the slightly gothic aesthetic of a skull will spice up your outfit with some mystery. Now, there is always history behind virtually any jewelry piece. And the same is true with skull jewelry. Many cultures in history wore the skull as a symbol of power. In the 16th century, Venetian painters made use of the skull and continued to use the phrase “memento mori” meaning “remember death”. Although not the ideal phrase you would like to hear, the skull was a remembrance of people’s mortality. The Egyptians and Aztecs used the skull as a symbol of the cycle of death and rebirth. As you can imagine, death during this time was not surrounded by the stigma we view it as today. All symbolism aside, the skull today can be simply viewed as an edgy fashion statement within the jewelry industry. Check out our 3 favorite ways to style this peculiar yet enticing piece. Mix the trendy style of a skull with the 90’s vibe of a choker and you will have the recipe for a rocker-chic look. Mix up your usual necklace style with a choker embellished with skulls and, while you’re at it, put some charms on it! A leather choker punctuated with skulls and charms will give your jewelry box the edge it needs. Pair this choker with a black, flowy t-shirt, boyfriend jeans, a statement belt, and a pair of Dr. Martens. This look is definitely for women who are not afraid to play with their style choices. Add a rope-like feel to your outfit with a layered skull necklace. Some pendant skulls on the layers will add a subtle edge to the chain and will never be too overwhelming. The eye-catching look is versatile and adds a dainty appeal that would match well with any outfit. For a casual, on-the-go look, wear the layered necklace with an oversized cardigan, flowy shorts and white sneakers. 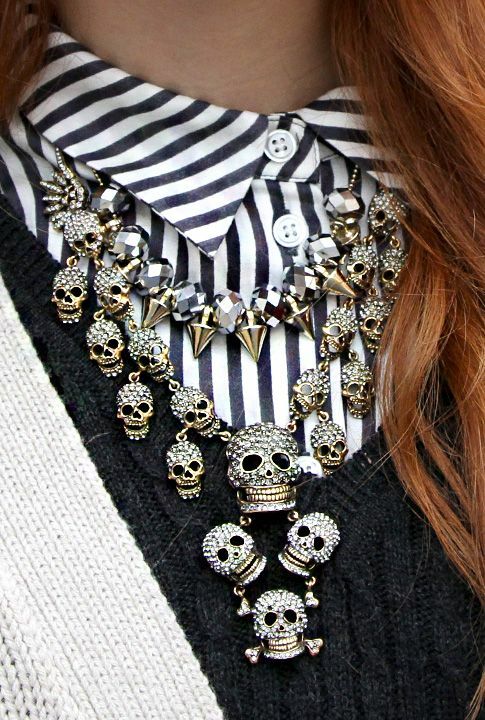 Not only will this look chic, but you will look like a total fashion icon flaunting your skulls necklace! If you know Ana Luisa Jewelry, you know we love making a statement with our jewelry. If not, you have some catching up to do! Whether it’s bracelets, rings, earrings, or necklaces, we strive to be unique and genuine in our designs. Our team of stylists agree the skull adds an unconventional look for any woman. Be proud to stand out in your statement skull necklace and you will always appear cool and confident. Style this necklace with your favorite graphic t-shirt, colorful culottes, and sneakers for a delightful combination! This loose, whimsical look will even out the bold statement skull necklace and enhance your overall ensemble. Now you can see how skull necklaces add that extra something to your outfit. Make your first skull necklace purchase and you won’t regret trying the edgy trend! Check out our existing collections on our online jewelry shop website and keep an eye out for new releases every Monday! Black Pearl Necklace – What is it?